January 26, 2019 By Bob Pilgrim & filed under All Articles, Handguns, Weapons. 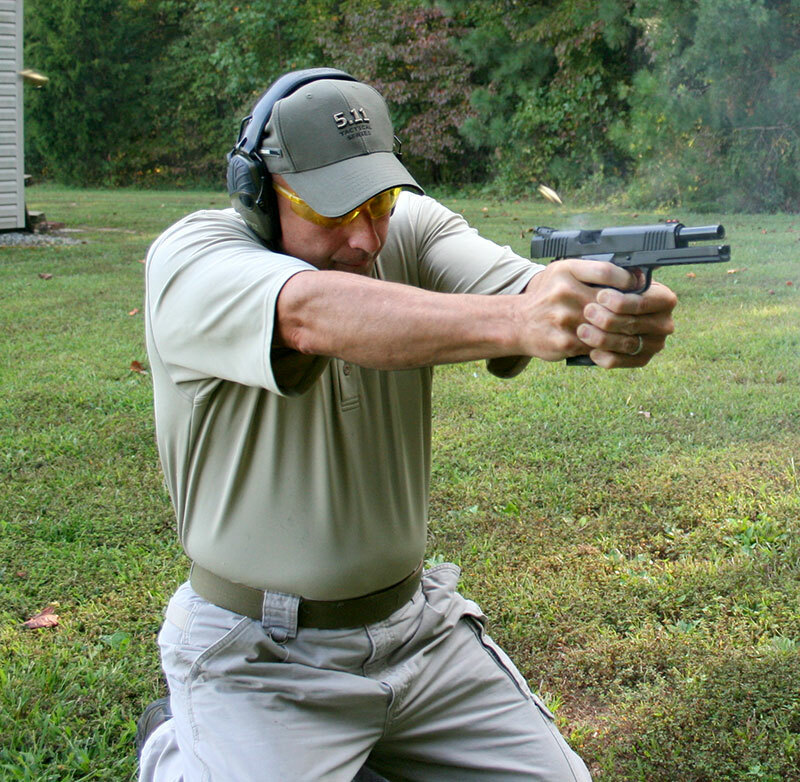 All-steel Tac Ultra FS HC pistol is versatile and can perform well in competition and defensive venues. Slide is forged and frame is cast 4140 steel. Fit and finish are very good. Fore and aft slide serrations are deep and effective. A reputed gun guru recently opined that the new striker-fired pistols have rendered all-metal hammer-fired handguns obsolete. The sleek polymer-frame striker-initiated pistols offer everything an exposed hammer system does but with the added advantage of a more sealed system that makes the pistol more resistant to battlefield debris. It is the handgun system of choice for the big Army and Special Forces, replacing the hammer-operated Beretta. The FBI continues to favor a striker-fired sidearm and, although agents generally function in more sterile environments, its HRT and Field SWAT teams often operate in severe terrain under deleterious conditions. Furthermore, a number of major firearms manufacturers whose bread and butter guns are hammer fired have noted the trend and offer their own versions of the striker-fired phenomenon. One-handed shooting was just as pleasant as two-handed grip. Biggest distraction was pistol’s weight. However, Armscor (Arms Corporation of the Philippines) and Armscor Precision International, the Filipino arms manufacturer and exporter through its U.S. trademark Rock Island Arsenal (RIA) disagree and have joined several all-metal handgun producers who primarily offer a plethora of 1911s and clones. Armscor has muscled its way into this highly competitive market that some consider flooded with examples of John Browning’s masterpiece in various sizes, calibers, and unique versions. But they have taken their market plunge a step further and offer quality pieces that run the gamut of shooting demands at a price the average Joe can afford. Frankly, while high-dollar Government Models are appreciated for their jewel-like appearance, first-rate parts and skilled fitting, tuning and assembly, average gun enthusiasts often balk at the high costs associated with these guns. 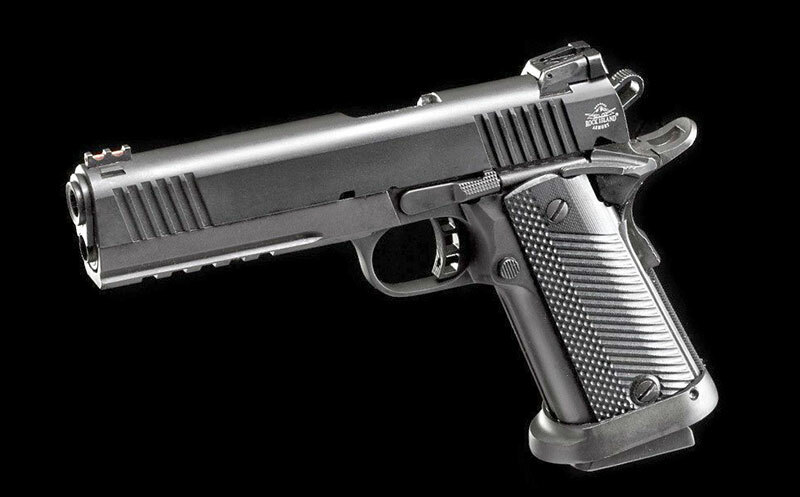 Usually you get what you pay for, and some RIA Pro models eclipse the $1,000 mark, but surprisingly and to the chagrin of custom houses, these lower-priced 1911s for the masses often perform on par with their more expensive siblings, but perhaps without the longevity that these $3,000 creations promise. 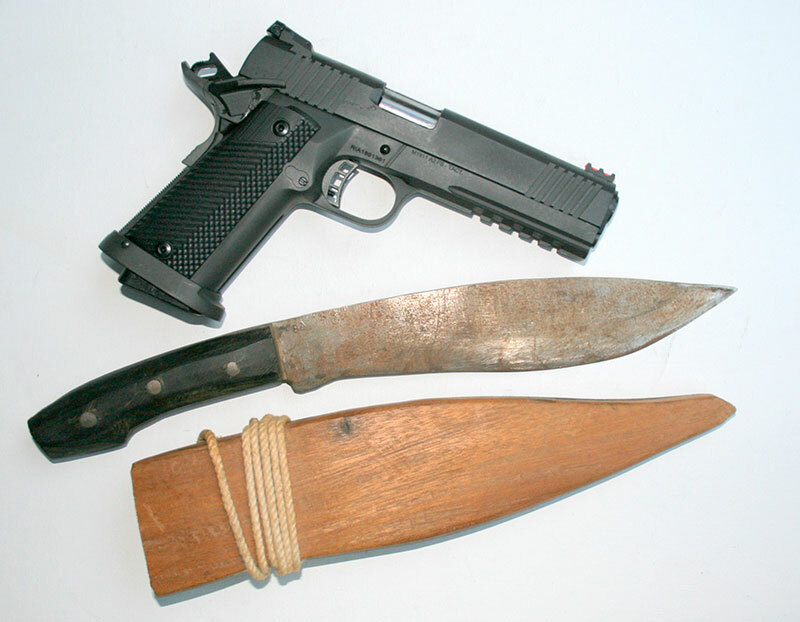 Tac Ultra FS HC pistol with author’s bolo knife. Made by a Negrito at a Philippine Jungle Survival School from auto leaf spring, author used it in Vietnam. As many readers may know, the 1911 holds a revered martial place in Filipino society, even though during its introduction to the archipelago, Filipinos were on the receiving end of its heavy slug. My father fought in the Philippine Insurrection, and his .45 Long Colt Single Action Army was eventually replaced with a 1911. The six gun and its black powder cartridge were sent to the battlefield as an emergency replacement for the anemic .38-caliber revolver that failed to stop enemy fanatics. My Dad used to regale me with stories of charging Moros and how the new semi-auto was frequently defaulted to, because the caliber open-stocked .30-40 Krag-Jorgensen rifle became too hot to hold onto after a number of strings of rapid fire. With a bit of old soldier exaggeration, he demonstrated with a finger gun the jolting recoil of the .45 ACP, which led me to believe the 1911 punished the shooter as well as the shootee. When I was an FBI agent on assignment in Manila many years later, my police counterparts proudly displayed their personally owned 1911A1 pistols. Most were nickel plated to frustrate rust, but also to be highly visible to demand a felon’s recognition and respect. Extremely expensive to import, many personally owned 1911s were home grown in illegal jungle workshops and, in spite of questionable metallurgy, worked and looked pretty good. Ammo was expensive and some of the cops reloaded, favoring lead semiwadcutter slugs made from wheel weights. The military continues to carry 1911s and most of the pistols are former U.S. Army dating back to World War II, but government ammunition is tightly controlled. 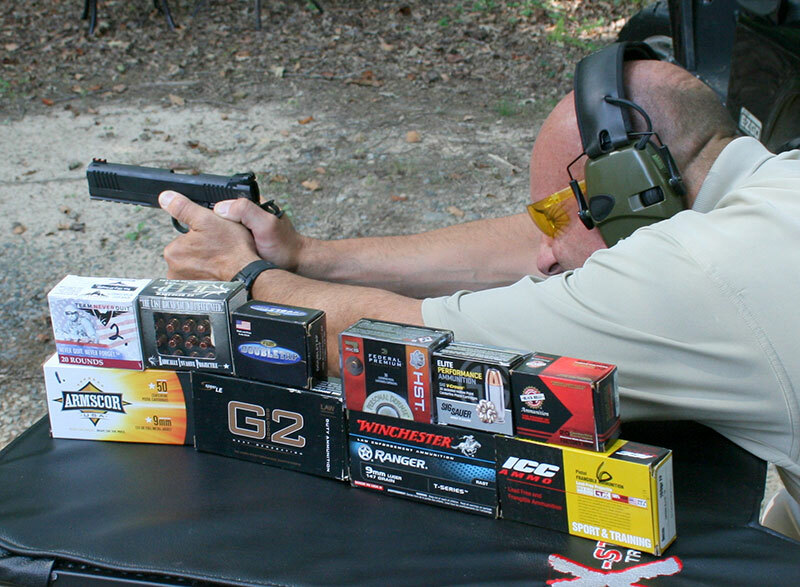 Nevertheless, there is a thriving action-shooting community with pro shooters on Team Armscor and the weapon of choice is the 1911, preferably in the configuration of the model I am evaluating here. With extensive practical experience with “old slabsides” almost from its combat inception, Armscor probably produces more 1911s than any other manufacturer, and the TAC Ultra Full Size High Capacity (TUFSHC) 9mm Luger (9x19mm) is one of its most contemporary multipurpose offerings. It is one of several single- and double-stack all-steel pieces that can campaign in IPSC Standard, Open, and Limited 10 events. IDPA competition is currently unavailable because of the TUFSHC’s overall size and weight. Competition aside, with its forged 4140 steel slide and cast receiver, the TUFSHC could, with minor tweaking, serve as a SWAT sidearm filling a leg-drop holster. Although the trend in Tier One counterterrorist teams is toward plastic and striker-fired handguns, all-metal hammer-fired guns may still enjoy an edge in accurizing and will continue to fill both primary and secondary tactical weapons roles with distinction, where high degrees of precision are required. TUFSHC slide’s dorsal surface features fiber-optic front sight and fully adjustable rear. Ejection port is lowered and flared for positive ejection. The TUFSHC weighs almost 50 ounces with its empty 18-round steel magazine. With its five-inch button-rifled barrel, it is a big and heavy pistol. Add 7.8 more ounces when it is fully loaded with 19 rounds. When I first picked up this beast, I became nostalgic. For years, I competed with high-capacity Para Ordnance pistols (now owned by Remington) in .45 ACP, and for a few years, FBI HRT adopted the wide bodies customized by a noted gunsmith, but could not get the pistols with his slide on Para frames and Para magazines to work properly. The magazines were a constant problem and had to be kept scrupulously clean. Between competition stages, shooters brushed out their interiors. Prior to matches, I usually stripped, cleaned, and sprayed the gun with silicone to encourage smooth functioning. When I asked the company’s media rep if the TUFSHC was a Para copy, he adamantly denied any association. But my old Para magazines were accepted and jettisoned by the TUFSHC like they were made for the gun. This compatibility is good news in a sense, because the pistol comes with only one magazine. Additional RIA magazines will set you back $40 each. Para 9mm magazines are available, but unlike their .45 ACP brethren are expensive and hard to find. Not providing a second tube to conduct mandatory or discretionary reloads indicates to me that Armscor has not properly assessed the American shooter or is just plain cheap. 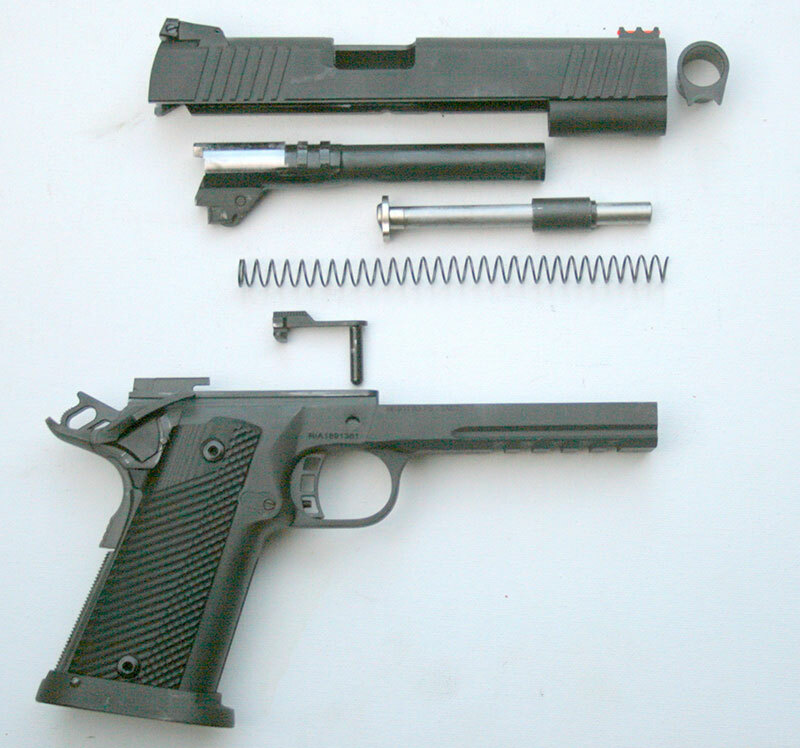 TUFSHC field stripped, revealing barrel bushing, reverse plug, steel guide rod, recoil spring, and slide stop. Barrel with swinging link is 4140 carbon steel with 1:16 twist. The staggered box magazine’s specified capacity is 17 rounds, but I could insert 18 without any drama, making the pistol a 19 shooter. RIA frowns on this and cautions that its rated capacity should not be exceeded. Since I am complaining, the only other criticisms I have are in regard to the bilateral thumb safeties and omissions in the TUFSHC’s manual. Safeties are enlarged but barely adequate. They should be larger and of the “gas pedal” style. The company has been repeatedly advised by end users to melt the edges of the safeties, because they are pretty sharp. The manual contains no instructions on rear sight adjustment, so time and ammunition are wasted with trial and error. No words are devoted to magazine maintenance, which is often overlooked by the gun owner. The pistol features two active and three passive safeties. Accessories within its carry case are spartan. It contains one magazine, a security lock, samples of fired cases, a manual, and documentation. TUFSHC receiver is cast 4140 steel and features full-length dustcover with Picatinny rail. G10 grips, backstrap checkering, and raised beavertail grip safety contribute to good ergonomics and overall control of the pistol. 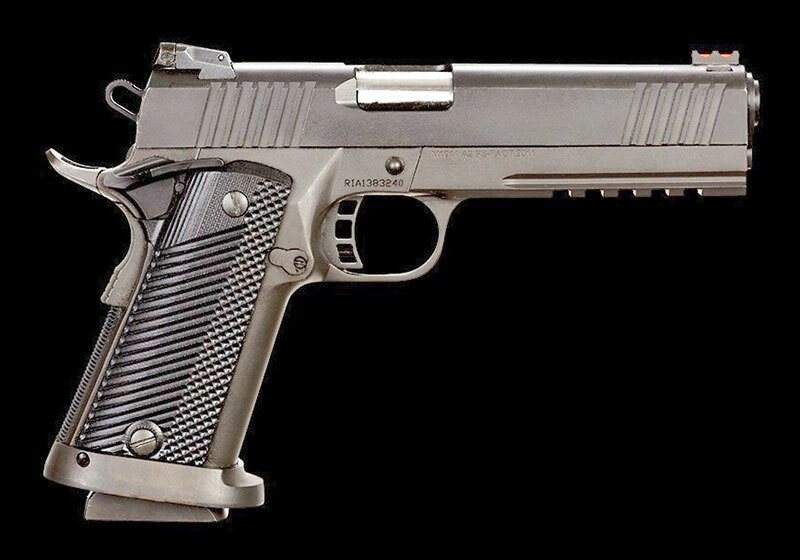 The TUFSHC’s completely Parkerized 4140 forged steel slide and 4140 steel cast frame make a handsome 1911. Refreshingly, its slide is free of dire warnings and cautions. It has a brutish look, and feel is augmented by many custom and race-gun features. At the muzzle, its five-inch button-rifled barrel is bear hugged by a removable barrel bushing. RIA optimistically advises that the bushing can be removed with finger pressure alone. Its reverse plug is not only sharp, but its bushing is as tight as a rusted car bolt. A tight barrel bushing supports accuracy, and removing it eases the 12-pound recoil spring’s tension so the slide with its reverse plug, steel guide rod, recoil spring, and barrel can be separated from the frame. A plastic bushing wrench would be appreciated. Topside, it sports an orange fiber-optic front sight, but no fiber-optic replacement rods are included in the package. This set-up is great for daylight shooting but will not fulfill marginal light requirements. Its ejection port is lowered and flared. A prominent Novak-style fully adjustable rear sight with white framing dots brings up the rear. Fore and aft grasping serrations are deep and very positive. The 1:16 right-hand twist barrel has a traditional swinging link, but its chamber is fully supported and should handle the hottest 9x19mm loads currently available. A 1.5-ounce steel guide rod adds weight to the muzzle end of the pistol and prevents the 12-pound recoil spring from kinking. Its extractor is internal and the slide’s interior is smooth and free of tool marks. Its Series 70 inertial firing pin has no safety. Slide features fiber-optic front sight and fully adjustable rear sight, Commander-style hammer, and ambidextrous thumb safeties. Spanking the firing pin is a Commander-style skeletonized hammer. With the upswept beavertail and raised grip safety, it prevents the hammer bite that the GI version is famous for and ostensibly shortens hammer drop time. Its straight backstrap is checkered and abuts the raised grip safety. Attractive and practical G10 grip panels are held to the frame by hex screws. Emphasizing its competition intent is a prominent and wide-mouthed magazine well. Should this be part of a tactical pistol? Anything that makes reloading faster and more efficient is fine by me. The receiver’s front strap has linear striations, which may help with controlling gun torque. The port-side magazine release is raised and accessible without shifting the firing grip. Slide rails are normal length and do not extend farther into the dust cover, which includes a generous under-barrel Picatinny rail. Its polymer two-stage match trigger is adjustable for overtravel. Its take up is short, breaks cleanly at 4.50 to 4.75 pounds, and resets quickly. 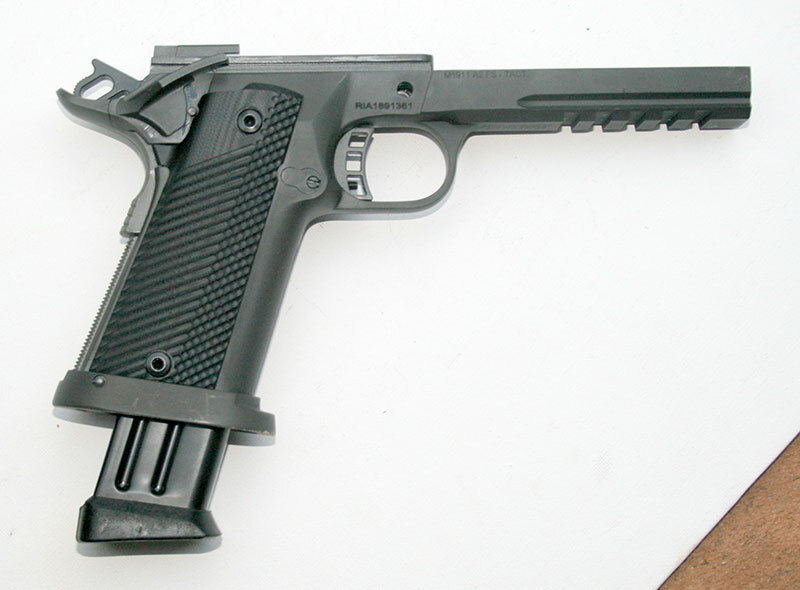 Trigger guard is conventional 1911, but could be larger to accommodate gloved fingers. Blue staggered box steel magazines appear to be proprietary and come equipped with substantial base pads. Fit and finish are impressive, but can it shoot? Former FAM Ken Trice fires 25-yard groups from handheld rest. Ammo in foreground was used for evaluation. Ten different commercial loads were selected, ranging in weight from 90 to 150 grains to determine what the TUFSHC likes. Sighting in was done with Armscor 124-grain FMJ ammunition. Former U.S. Air Marshal Ken Trice shot the accuracy phase of the evaluation. After shooting this hybrid, Ken and I gave it more of nod toward its competition use. Its dimensions and weight preclude enlisting it as a concealed-carry piece, and police officers have enough weight on their duty belts without adding more weight than necessary to perform their duties. With minor tweaks, it could serve as a SWAT officer’s sidearm in a leg-drop or battle-belt holster. Militarily, it violates the sacred quest of lightening the infantryman’s load. With night sights, it could function as a house or car gun. Former FAM Ken Trice drops to double kneeling position and hammers target with multiple rounds. Recoil’s absorbing weight facilitated low split times for double taps and hammers. Little effort was required to bring muzzle back down from muzzle rise. 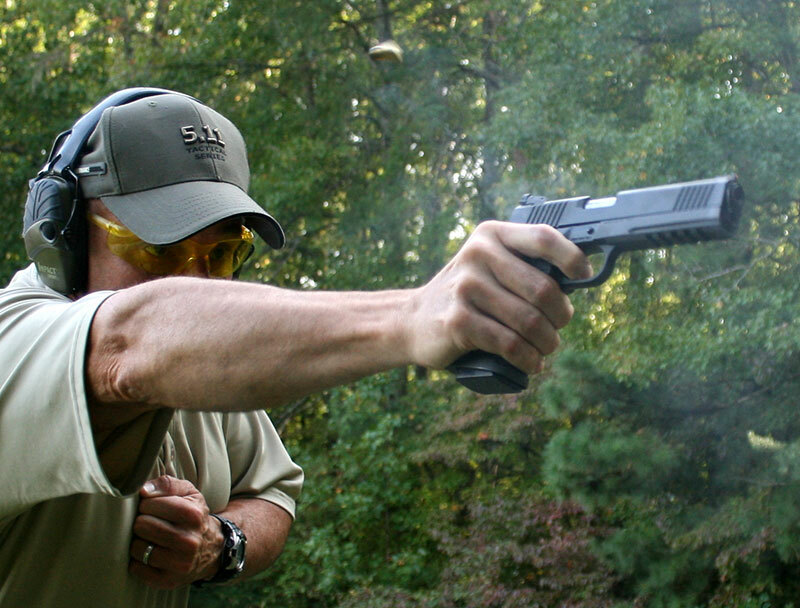 If you are sensitive to recoil, this pistol will make you happy. It has a heavy but good trigger that is better than the majority of out-of-the-box 1911s. 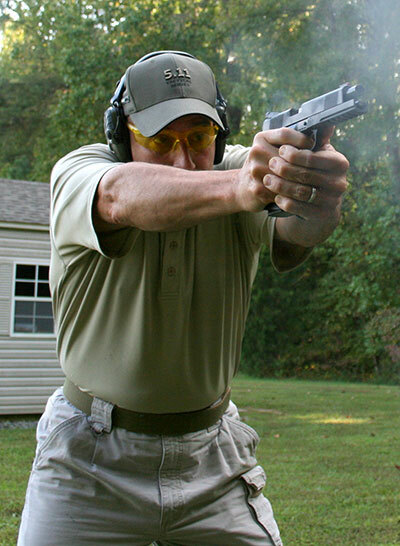 Together with gun weight, very fast splits could be realized, with the pistol habitually re-indexing the target without much post-recoil effort. This is a good close-quarters fighting pistol. In contrast, if I were to enter it into competition, I would probably lose some of its trigger pull weight. Ken disagreed. He is a proponent of stock triggers and has become comfortable with heavier levers. As is or with minor tweaking, the TUFSHC is a great gun for the entry-level action shooter. We experienced zero stoppages. It gobbled up everything from light to heavy that we fed it, and groups were fairly close to each other regardless of bullet weight. It’s not a tack driver, but more than adequate for duty or action shooting. The tightest group of 1.21 inches was delivered by Double Tap 124-grain +P JHP. Highest individual round velocity of 1,305 fps was achieved by International Cartridge Corporation’s 100-grain frangible Flat Point training round. Felt recoil, even with +P ammo with two-handed grip, was extremely mild and an almost zero distraction. TUFSHC has aggressive fore and aft slide serrations. The Double Tap +Ps were stout, and Ken remarked to that effect after breaking the first shot. Fired cases puddled together four feet to the shooter’s right rear. The hotter rounds exhibited longer flight time and segregated themselves from the rest of the rounds fired. The TUFSHC will handle the hottest +P+ rounds on the market and may be able to tolerate 9mm Super for competitive purposes. The TUFSHC is a fun gun to shoot and may enable average shooters to speed shoot a notch or two above their current skill levels. Fit, finish, components, and reliability are impressive for the price. Right now, these pistols are bargains. Current costs are in line with a company trying to gain a foothold in the American market. After that happens, prices will rise commensurately. Of course, steel/alloy hammer-fired handguns are far from dead, in spite of the trend toward striker-fired pistols that has been reinforced by the military and FBI. Armscor/RIA products are renewing interest in the 106-year-old pistol that helped shape Philippine destiny, and they have made Mr. Browning proud. Five-round groups obtained from handheld rest at 25 yards. Average five-round velocities obtained via M2 chronograph ten feet from the muzzle. Temperature 90 degrees.